↑ ক খ Allison, Christine (২০০৪-০২-২০)। "Yazidis i: General"। Encyclopædia Iranica। সংগ্রহের তারিখ আগস্ট ২০, ২০১০। There are probably some 200,000-300,000 Yazidis worldwide. ↑ "Yezidi"। Adherents.com। সংগ্রহের তারিখ ২০০৮-০৩-৩১। Cites estimates between 100,000 and 700,000. ↑ MacFarquhar, Neill (২০০৩-০১-০৩)। "Bashiqa Journal: A Sect Shuns Lettuce and Gives the Devil His Due"। The New York Times। সংগ্রহের তারিখ ২০০৮-০৩-৩১। Yazidis pray three times a day, at dawn, midday and sunset, facing the direction of the sun each time. 'The sun is very holy to us,' said Walid Abu Khudur, the stocky, bearded guardian of the temple built in honor of a holy man here. 'It is like the eye of God, so we pray toward it.'... They have adopted Christian rituals like baptism and a smattering of practices from Islam ranging from circumcision to removal of their shoes inside their temples. The importance of fire as a divine manifestation comes from Zoroastrianism, the ancient Iranian faith that forms the core of Yazidi beliefs. Indeed their very name is likely taken from an old Persian word for angel. ↑ Hedges, Chris (১৯৯৩-০৫-৩১)। "Sheik Adi Journal: Satan's Alive and Well, but the Sect May Be Dying"। The New York Times। সংগ্রহের তারিখ ২০০৭-০৭-২১। The Yazidis, who are part of Iraq's Yezidi minority, had 100 of 150 villages demolished during the counterinsurgency operation against the Kurdish rebel movement that reached its peak in 1988. The campaign, which moved hundreds of thousands of people to collective villages, saw 4,000 Yezidi villages dynamited into rubble. ... 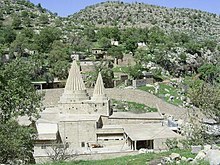 The sect follows the teachings of Sheik Adi, a holy man who died in 1162, and whose crypt lies in the shrine in the Lalish Valley, about 15 miles east of Mosul. The shrine's graceful, fluted spires poke above the trees and dominate the fertile valley. ... Like Zoroastrians they venerate fire, the sun and the mulberry tree. They believe in the transmigration of souls, often into animals. The sect does not accept converts and banishes anyone who marries outside the faith. Yazidis are forbidden to disclose most of their rituals and beliefs to nonbelievers.